It is unlikely to come as a surprise to anyone to find another reference to the negative effects of smoking tobacco on your health. We often hear about concerns related to cancer or to heart disease, and the benefits of quitting smoking. What people may not be so familiar with, are the musculoskeletal effects of smoking. As one might expect, there are problems that occur in the musculoskeletal system when people smoke cigarettes. It's important to understand how smoking causes these problems, what to be aware of, and how quitting smoking can improve your musculoskeletal health. Despite the well-known health-related consequences of smoking, there are more than 50 million smokers in the United States, and about 300 billion cigarettes are smoked every year. The cardiovascular and pulmonary effects of smoking are very well-known, and smoking has been implicated as a cause of numerous different cancers, not just lung cancer. Smoking is the leading avoidable cause of death in the United States. Cigarette smoke is harmful for a variety of reasons. When smoking a cigarette, about 500 different gases are released including carbon monoxide, ammonia, and hydrogen cyanide. There are about 3500 different chemicals in the particulate component of cigarette smoke including nicotine. These chemicals cause a variety of problems for the musculoskeletal system including changes in circulation, decreased oxygen delivery to the tissues, changes in cellular function, and other problems. The different biological effects of smoking cigarettes lead to problems related to a number of different conditions. These conditions can affect your bones and joints in a variety of ways, and they can also affect how you respond to treatment of a number of different orthopedic conditions. Changes in blood flow, cellular activity, and oxygenation of tissues have all been implicated as reasons that cigarettes can impact your health. Osteoporosis tends to occur in women at a younger age than in men. People who develop osteoporosis are at a much higher risk of fracturing a bone. People who smoke cigarettes have a much higher risk of developing osteoporosis and also have a higher risk of fracturing bones as a result of decreased bone density. The exact cause of low bone density in smokers is difficult to determine. Part of this reason is that smokers are also more likely to have the aforementioned risk factors including being thinner, having a poor diet, and being less physically active. Despite this, there is evidence to show that smoking also has a direct impact on bone health leading to worse bone density. The healing of broken bones requires a robust response from the body in terms of oxygen delivery and cellular function at the site of the fracture. People who have sustained broken bones who smoke cigarettes are at much higher risk for problems related to healing of the fracture. Most worrisome is a condition called a nonunion where the bone healing response is impaired. A nonunion is a problem that occurs when the fracture does not heal properly and can lead to persistent fracture symptoms that may require further intervention, including surgery. The risk of nonunion is higher with certain types of broken bones, with open fractures, and with badly displaced fractures. In addition to having an increased risk of nonunion at the fracture site, smokers can have other problems that occur when a bone brakes. An infection can develop in the area of the fracture, and the risk of infections is much higher in smokers. This is particularly a problem when people experience open fractures where the bone penetrates the skin making the fracture site susceptible to infection. Another problem that occurs in smokers is increased pain at the fracture site. Smokers tend to have more pain when they fracture of bone and people who do not smoke cigarettes. Episodes of acute low back pain get a lot of attention. Almost everyone will experience an episode of severe acute low back pain at some point in their life, but the good news is that these episodes tend to resolve uneventfully over a course of a few weeks or months, and people resume their normal life and activities after a short disruption. However, some individuals will develop more persistent, chronic low back pain. Smoking has long been found to be associated with chronic low back pain. It is difficult to know if smoking is the direct cause of chronic low back pain or merely associated with this condition. People who smoke tend to have poor overall general health, and they tend to exercise less. These factors may contribute to the development of chronic low back pain. That said, there may also be an effect of cigarette smoking that impacts the health of the lumbar spine. Specifically, the effects on blood supply and nutrition to the intervertebral disks have been implicated as a possible source of low back problems in people who are smokers. Recovery following many surgical procedures is slower, and fraught with higher complication rates, in people who smoke cigarettes. Blood flow in people exposed to cigarette smoke is known to be compromised, and the oxygen delivery to the tissues recovering from surgical trauma is diminished. Many surgical procedures, including joint replacement surgery, have a higher chance of wound complications and delayed healing in people who smoke cigarettes. Surgical recovery is especially problematic in people who are recovering from procedures performed for fracture repair, or people who have implants being inserted into the body. These individuals are at risk for intentional complications including nonunions (as mentioned previously) and infection of implanted materials. In people who do get an infection after a surgical procedure, smokers have a much more difficult time finding the effects of the infection. Smoking directly impairs the function of certain white blood cells that are the primary cells that fight infection within your body. In addition, as was the case with fracture treatment, smokers have a higher level of pain than non-smokers after surgical treatment. Cigarette smoke has been shown to increase generalized inflammation within the body, and may also alter the way that your body perceives pain signals. For these reasons, people who smoke cigarettes have a higher level of discomfort and require more medications in order to control their pain. The requirement of more pain medications can lead to other problems such as addiction to narcotic pain medications. For all of these reasons mentioned, some surgeons may refuse to perform certain surgical procedures until people can quit smoking in order to ensure the lowest possible chance of complications. Numerous studies have investigated the effects of smoking cessation on the aforementioned problems related to tobacco use. The benefits of reducing complications associated with surgical intervention have been clearly demonstrated in many studies. For example, patients who underwent a one-month preoperative intervention prior to joint replacement lowered their complication rate from 52 percent down to 18 percent. Even for emergency surgery, where smoking is not stopped until the time of the surgical intervention, the risk of complications is dramatically reduced in people who are able to quit. From a cost standpoint, the benefits of quitting smoking are numerous. From decreasing the expense associated with complications, to reducing the duration of healing after an injury, to minimizing lost days of work, there are numerous economic benefits to both our society and to the individual by quitting smoking. From an individual standpoint, the cost of quitting smoking cigarettes include the health benefits, productivity benefits, and decreased cost of cigarettes. If you are considering quitting smoking for one of these reasons, or for any other reason, the best thing you can do is discuss this with your healthcare provider. Abrupt smoking cessation and gradually reducing consumption of cigarettes are typically unsuccessful. The best ways to quit smoking include counseling, group therapy, physician-guided programs, nicotine replacement therapy, and medications. It probably comes as no surprise to read about the health benefits of quitting smoking, but many people are unaware of the implications on the musculoskeletal system, and the risks related to surgical intervention, that smoking cigarettes causes. The good news is that there are effective treatments that can help people quit cigarette smoking, and even quitting in the immediate time period around an injury or surgery can lead to benefits in terms of healing and recovery. 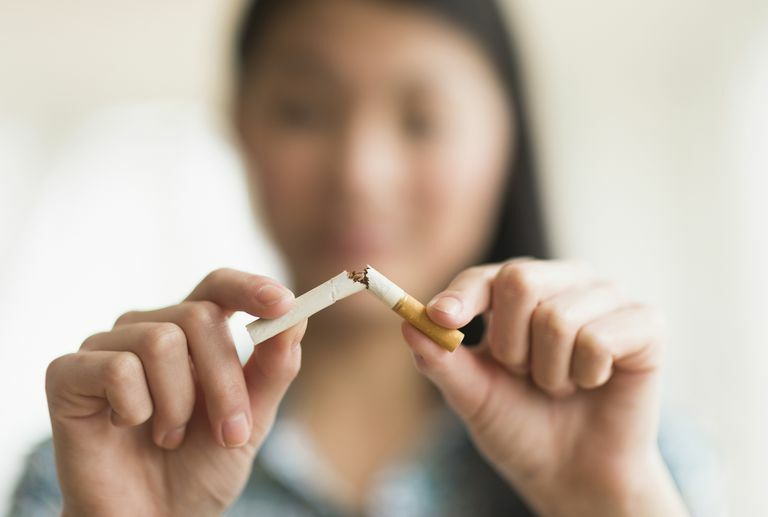 Everyone knows there are health benefits to quitting smoking, but sometimes it is not until these hit close to home that people make lifestyle changes. Perhaps it is a recent fracture or an upcoming surgery that will help to motivate you to quit smoking. Bedno SA, Jackson R, Feng X, Walton IL, Boivin MR, Cowan DN. "Meta-analysis of Cigarette Smoking and Musculoskeletal Injuries in Military Training" Med Sci Sports Exerc. 2017 Nov;49(11):2191-2197. Lee JJ, Patel R, Biermann JS, Dougherty PJ. "The musculoskeletal effects of cigarette smoking" J Bone Joint Surg Am. 2013 May 1;95(9):850-9. Argintar E, Triantafillou K, Delahay J, Wiesel B. "The musculoskeletal effects of perioperative smoking" J Am Acad Orthop Surg. 2012 Jun;20(6):359-63.